A few weeks back, I spoke about a very exciting event that was to take place on the 25th of September, encouraging young and old to be their own person and cut a new path instead of following those that are already there. The day had finally arrived – the inaugural Pioneer Nation entrepreneurial festival, where the public had a chance to engage with African entrepreneurs from all walks of life, telling their story of how they got to where they are now. 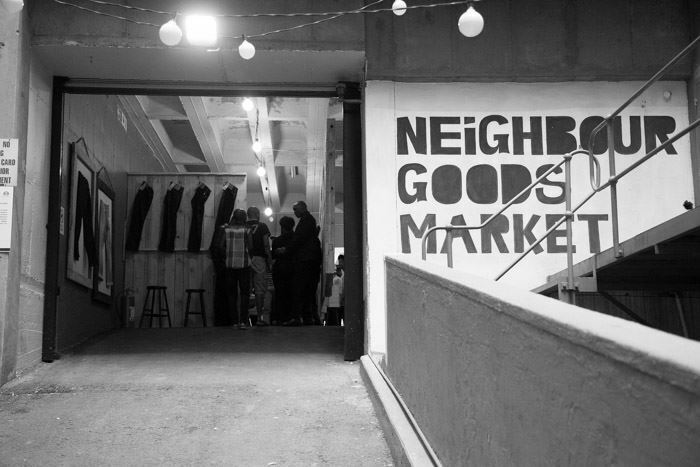 The day was hosted by Levi’s© at one of South Africa’s best examples of that entrepreneurial spirit – Neighbourgoods Market. I entered thinking I might be the only fool in a short dress, freezing her leg hairs off in that concrete parking lot. Thankfully I wasn’t alone for too long – Poppy approached me and we started getting into how we ended up in Braamfontein on a randomly chilly Thursday morning. She told me that she had started a mentorship program for young girl in the township called the S.O.N.G. Foundation, encouraging them to be better than their environment. Having been raised in the township herself, she understood the challenges that face girls in coming out from there. Things that most suburb kids (like myself) take for granted are hard to come by not just in their schools, but also in the greater area. For Poppy, Pioneer Nation was an opportunity to get her organization to the next level, a chance for her to be enlightened to what she can do to make her girls’ lives better and get more from what they have given her. The first conquering Pioneer we had the pleasure of hearing from was none other than Nathi Maphumulo, better known locally and internationally as Black Coffee. His cousin and his cousin’s friend spent time mixing cassette tapes after school in their family home helped pique his interest in house music. From there, he wanted to create a sound that was new to South Africa and to the world. His work ethic and desire to do something different in the music industry got him to where he is now, and not letting other people’s fears of the unknown block his path. Another Pioneer who didn’t let the opinion of sheep get in his way is Mike Sharman of Retroviral. After getting his degree he moved to Hollywood to break ground at being a comedian. After six months, he came back to SA, using his skills of working with a crowd to make a wave in the marketing industry. Mike pitched an idea to Nando’s to stop wasting money on using only traditional methods of advertising and rather post their videos and posters to social media, such as Facebook and YouTube (see C.I. And The Unicorn). “Hustle, hustle, hustle motherfuckers!” he shouts over our heads, putting very simply the mantra of all entrepreneurs. No one I heard that day lives by those words better than Musa Kalenga. Look out for part 2 on this site tomorrow!